helps Postman Pat deliver the mail ~ 5th February 2009. Clever Conker. He doesn't seem to mind the snow with his nice fur coat. It looks quite deep TT. You have more snow than us, it's melting very quickly here. Conker doesn't seem to mind the cold too much! We have had about an inch but it is a bit slippery to walk on! Courageous Conker ! He went out into the deeper snow for me to take this picture. Postman Pat stayed safely in his van with Jess the cat ! Down south, Holly's snow has all gone ! It's been snowing here quite thickly this morning, but on the coast it may not be so bad. The forecast said rain but they're wrong. unless it turns to rain later. Whatever Conker is, he is soo cute. I would like to kiss his little ears!! Hope his little paws don't get too cold..
Hi. NN ~ Yesterday, Conker practised his Super Nanny routine. But today, his pretty pink pram would probably get stuck in the snow. Lol. 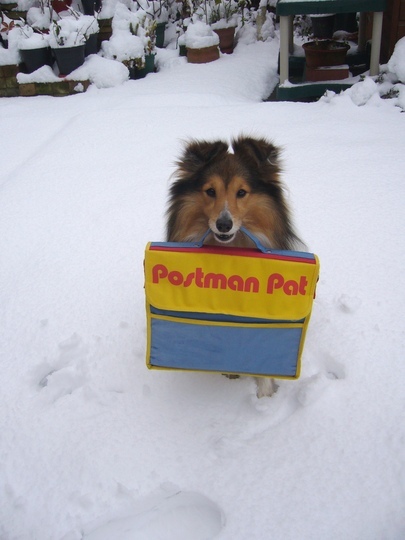 Great photo TT ,Conker could have delivered the mail here today,we have,nt had any deliveries because of the heavy snow. Oh, Janette, I've just been watching the TV news ! Looks like you've certainly had a lot of snow. How are your primroses coping. Are they under fleece ? Hello Irish. I guess you've missed out on these heavy snows ? Has Benny been visiting ? the heavy snow melted for the most part. still snowing but its not sticking now. Yay! Go Conker! Anything for me in there? Hi Sid ~ Conker is delivering diet sheets for the GoY Winter Wellie Olympians. Conker to the rescue!! Hooray!! Well done. Through snow and hail and dark of night....nothing will keep Conker from his destination. jerry is like that my springer lol whats conker as a breed ? Conker is a Shetland Sheepdog, or Sheltie. I'll tell Conker how brave you think he is being ! Almost trick practice time here. i wish hed deliver our post. we havent had post again today...i suppose thats what you get living in the middle of nowhere. Conker says sorry he couldn't travel as far as Wales to deliver your Wellie Olympics diet sheets today. Conker doesn't understand sending mail by second class. Everything has to be done FAST. lol. Our past experiences make us the people we are today. Good job Conker....does he get paid well for his work TT...? He looks to be needing a raise what with such deep snow and all...and such a loyal worker he is...promotion in the near future? Perhaps he could take up being a pilot and fly the mail over here! Wish Conker was my postie as I was expecting a parcel today and it didn't arrive.Great photo, TT and lovely pristine snow. Hi Conker, I've been waiting for my notification letter that I won the Publisher Clearninghouse Sweepstakes, and I was wondering if perhaps you saw it in Postman Pat's bag??? TT -- You really are amazing with your animals, that's for sure! I love this photo!!! Conker must make the neighborhood smile! little van which he tows, Jess the Cat, mailbox. LOL. Conker says that he tried to drive the van out today, but it got stuck in the deep snow ~ so sorry Gee's parcel is late. OH TT....look..behind Conker there...those pots...! They are everywhere...are they Flower Pot people in diguise...under the snow? They started out as pots, but are fast mutating into Flower Pot Snow People ! Oh well done and thank you Conker ...did you deliver my new book it arrived today the BTO Garden Birds and Wildlife , as recomended by a GOY member , I cant recall who it was at the moment , it,s from Amazon and it,s amazing value . Conker struggled a bit across to Norfolk in the deep snow with your heavy parcel, but he realised such a lovely book must arrive promptly and undamaged. TT? did you not notice...I asked about a raise for Conker for all his hard work earlier? Ahhhhh bless him, isnt he a sweetie? Yes, I noticed about the pay raise for Conker, but it had to go to review. Good news is he has been awarded an extra Bonio per parcel. Can I have on of those diet sheets please....I think I need one! Conker is on his way to you now. I've just come in from more snow-clearing ! This must be keeping me fit. Lol. I've scattered salt where my friends are likely to walk. Snow looks beautiful when it first falls, but I don't want it too often ! Yes, NP, I'm feeling really fit from all this snow-shovelling. Not sure what you mean about the gardening tips. Have you put something on questions ? Don't worry. I don't think you've written anything sarcastic. Oh dear I feel really guilty now getting poor Conker to come out in all that snow and blizzard.....and I haven't got any bonios....I've got Go-Cat if that's any good.....? Conker looks like he is enjoying his post round , wish he would call on me, Polly would help him! He's certainly a favourite with me! Conker loves the idea of Polly helping with his postal deliveries. Where's Jess, the black and white cat,then conker? Well done Conker, the mail must get through! Funny you should ask about Jess. I took some more photos today of Conker with his Postman Pat props ( indoors ) including the black-and-white cat ! Oh, Tt, Conker is a beaut! So the cat's not in the bag, then? I look forward to this new blog! I wonder if they get much snow in Shetland, being in the midst of a salty sea? Hello TT, I'll lookout for that blog. Glad that the black and white cat will be making an appearance as well as Postman Pat. Hooray for Conker. A very brave and daring doggie. Next he will be pulling a dog sled in the Ididarod. I had hoped he would deliver mail over here and have a whole bucket of milk bones ready and waiting for him. Oh well, I understand the constraints of the postal service. Conker has been out all day, with his black-and-white cat, travelling in his post van, bravely facing the snow and ice to get the mail delivered. He says thanks to Gilli for the milk bones, which gave him extra energy. He also brought post by sled to Littledove and Janey. And, yes, he does wear tennis shorts for our summer dog show "Best 6 Legs" competitions. Lol. Just too cute for words toonie what else can I say?!!! Seems all your computer problems are a thing of the past. Sorry, I think I missed you off my Canada map on the recent Winter Wellie blog. You're right. Some of those happy dogs wag so well they can clear everything off a coffee table with just one tail movement LOL. Conker seems to cope very well in the heat and in the cold. Maybe his lovely thick coat insulates him from temperature extremes ? That's a 1st Class delivery Terra! The snow is still out there. Not all melted yet. I am so impressed that Conker is not only carrying the mail but Jess the cat as well..does Jess ride in the bag or on his neck holding on to Conkers ears? Jess the cat usually rides on Conker's Royal Mail van. Snowing again ? Oh no ! Don't worry. My mailbag is full of dog biscuits. P.S. Have you seen there are more CATS just joined the Winter Wellie Olympic team. ! We still have the snow sitting here ! Has your snow melted ? You can see from the above photo how much snow I had in my gardens. Most of that snow is still there ! Yes, sadly lots of us will have lost plants. Had over an inch of snow last night and expecting more tonight. Was going into Derby to have a look round the shops and some lunch but given up as the roads and pavements are very icy. I think you're sensible, Linda, to say home safe and warm. I'll train Crocus the budgie to shred the bills by chewing them into little bits of paper. Lol. I use my shredded paper for my rabbits toilet box to mix with the sawdust to make it go further. He keeps the rest of his hutch clean. CAn I keep Conker for a while if he gets stuck delivering my post in the deep deep snow of the Derbyshire hills. He looks a lovely dog. If Crocus the budgie shreds up the bills, you will save on using the electricity for the shredding machine, thus saving the planet.......and recycling at the same time. the rabbit, Conker and Crocus. Conker also does tricks vacuuming and sweeping, so if he stays for a while, he'll help you with the cleaning. All I can say is if your palm thinks it is springtime, you probably live in one of the extra-warm Norfolk hotspots. Were you sunbathing today ? LOL. What a great dog, to do the cleaning, and sweeping, yes he can certainly come to stay. What are his rates of pay.....T Bone steak I've no doubt, as for the budgie will a packet of seed do? with mirrors to improve his work environment. Lol. and gave up cos it was boring. so Peter's warm on his new bed. How are you ? Is your garden still there under the snow ? NP ~ jh is NEVER wrong. LOL. I even have snow this morning...and after I saw my Spring Robin too...! Conker sounds quite busy there with cleaning and all...my dogs are lazy in comparison...one on my legs sleeping now..one at end of couch and one on the floor..all sound a sleep..not one thought of delivering mail....humph. Some parts of Britain now have floods from lots of rain and from melting snow! Everyone will be very happy to see springtime. Sunny with blue skies here, but we still have snow around. I went into Derby today and the streets were o.k. there, but we still have snow on the pavements that are not in the sunshine, and there is snow in the garden, but it's melting. I saw a street person who looked at me and asked if I could help. I bought him a hot cup of tea and a beefburger and got his dog some biscuits. Perhaps his circumstances took a turn for the worse and landed him on the street or perhaps that's how he likes to live I didn't know or ask but he looked cold and the dog was sat on his lap on the floor. I did what I thought right. I wouldn't give him money. The greenhouse arrived this morning at 7.20a.m. I will be able to grow some indoor tomatoes and peppers this year. YIPPEE! Great news about Linda's new greenhouse ! I think she made absolutely the right decisions about the street person. Hot drink, warm food and biscuits for his dog. Not money. The fact that his dog was on his lap and not on the cold pavement is really nice. yes, with the British weather, I'm often in shorts and wellies. Lol. I've got to help Gerry erect the greenhouse YET!!!! just hope we get all the bits in the right places...........or it may be the only crooked greenhouse in the whole of Derbyshire!! Working title : Derbyshire Designer Hothouse. Lol. here here to ya lindak you did the right thing and your right about his dog. I guess you have even more snow than in this photo right now ! What does Lassie think of the snow ? It's your sunny smile that keeps your garden so warm. Lol. The last of the snow has just about melted today ! It took ages to finally disappear. It's the in thing...the fashion for men to have their hair shaved off. I always think back to history and how fashion goes around, the Romans, and the time when in English history that the women and men wore powdered wigs, because they had there heads shaved or had very short hair. Is that what Conker is delivering in his mail bag ? Toupees and wigs ? Lol. Hairstyles go in and out of fashion, just like garden designs ! Perhaps the dogs get together and make toupees and wigs from the dog hairs and sell them to the humans. It is lovely clean, strong hair. This spinning is done with the combings of quite a number of hairy breeds ~ e.g. Rough Collies. delivering mail to every door. to disguise all your hair split ends. or tattyanna from the mutt. Want to look just like a diva ? Use gold hair from your Retriever. Smart moustache that's really jolly ? Combings from your Bearded Collie. Need a wig to really please ? Steal one from your Pekingese. Might require its own toupee ! Think your hairstyle could look better ? Tints and hints from your Red Setter. Need to be a stunning hottie ? Hair extensions like your Scottie. Conker brings them. Yes he can. Through the snow in his red van. What are you going to make with the doggie hair? Knit a jumper? or make a cushion cover? I have some hair combings stored from a previous Sheltie. The hair is clean and good quality and keeps well if stored in cardboard boxes where it can 'breathe'. Phoebe's undercoat s so soft..I always hate to toss it out but leave it to the birds for nests...how long does it have to be to be spun her underdoat is only about and inch at the most...hhhmmmm? I'm not sure on coat length for spinning, but an inch sounds a bit short. not sure about that ....I have only seen the wool knitted and then felted.. Nominated for goypedia snow pics!! You should knit Conker a winter coat from his own hair!! Exactly! And it would be totally natural! Lol! I've suggested this for snow AND Xmas garden pages!